Before anyone asks the obvious question, let me remind you that there was a strong connection between the Lancashire canary and the Lizard canary in the first half of the twentieth century. 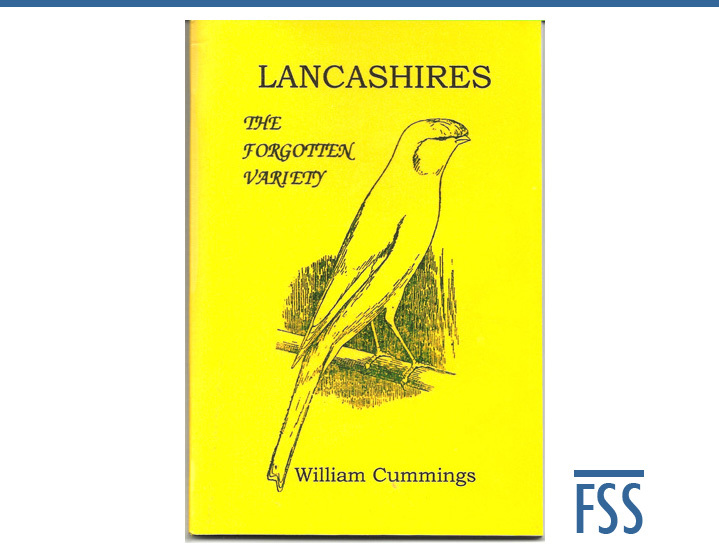 This was thanks to the activities of the Lancashire and Lizard Canary Fanciers Association, the closest thing that the Lizard had to a governing body from around 1900 to the Second World War. I only became aware of the book thanks to Marko Dielen, who just happens to keep both Lizards and Lancashire canaries (he won a silver medal at the 2015 World Show with a Lanc). The book was published by William Cummings from Falkirk in 1995. As the title suggests, the book is concerned mainly with the Lancashire canary, but there are some interesting asides for Lizard fanciers, most of which involve low deeds by people in high places. A juicy scandal always makes for an interesting read. As books go, this one is compact: just 70 pages at A5 size. What it lacks in quantity is more than outweighed by the quality of the content. Mr. Cummings traces the history of the breed and its breeders; the plundering of the Lancashire genes to increase the size of other varieties; the damage caused by cross-breeding with Crest canaries to ‘improve’ the coppy; the demise of the breed; and attempts to resuscitate it after the Second World War. Those wanting a manual on how to keep, breed and show modern Lancashires will have to look elsewhere. The great strength of the book is the extensive research undertaken by the author, combined with a rare ability to present the findings in a straightforward and articulate manner. It is an enjoyable and stimulating read. If there is one disappointment, it is that the book has not been updated since publication. I would be very interested to read his assessment of the modern Lancashire canary, particularly the style of birds developed by continental breeders. The real thing or just look-a-likes? I would trust Mr Cummings’ judgement. For classic Lizard canary fanciers, the book strikes a chord with the tragic account of how the ‘giant of the fancy’ could be reduced from being a well-established variety to a scattering of stragglers over a few decades, thanks to the attentions of cross-breeders who assumed there would always be plenty more where they came from. There weren’t, and the true Lancashire canary died out during the Second World War. Lancashires, the Forgotten Variety is available here for the bargain price of £4.50 plus postage. I recommend it to everyone with an interest in canary history. I want to buy this book but the link is not working- Please help me to purchase and/or learn more. I am getting back into canaries again and very much want to work with the old-standard Lancashires. Replies can also be made to my email s4me2u@aol.com. I am in US. Thank you. Like you I am trying to buy this book without luck. Canarybooks are not selling books at the present time. Any suggestions would be welcome. I was lucky to get mine from the source but it was last year (?) or further back, and would have to do some digging to find contact info (if I can even find it again. Maybe someone here remembers? And yes, it’s a shame, I fear for the song canary fancy, at least in the US….I think there is still some interest in type breeds though. I was amazed to find a white Yorkshire in a local big box pet store a year or two ago, thank God I was able to buy him before he got sicker and treat for air sac mites and he is singing this winter again. Right now he is my only canary and I cherish him. Fascinating little booklet by the way. I ended up buying at least one other title from him. Thanks for your reply. I am an Englishman retired to Spain. After many months of looking I have at last bought a pair of Lancashires to be delivered Tuesday. (Only a pair available. The amount of information about them seems very scarce . Although I have kept and bred canaries for many years getting information on their diet and show cages is very difficult. All I seem to find is high in protein and Lancashire Show cage. What is high. and what is a Lancashire show cage. Forgive if I am wrong, but it seems the original Lancashire is an extinct, so you would have a reconstructed type which is similar? There are a few people trying to re-create this splendid variety, I do not know show requirements (cages etc) for them but am curious who you obtained stock from? I am aware of one gentleman breeding very nice birds and remember seeing a video of them at a show. Possibly extinct, I do not know. There are a number of breeders here in Spain. There is an Internet site here named Milanuncios. If you go into this site and enter Canario Lancashire you will see adverts for these canaries. My investigations so far show that the original stock seem to come from Holland and Belgium. I get the impression it is a bit of a closed shop and a few breeders only deal with each other. Whether these birds are from the original stock I do not know but would like to find out. Gordon, I have contacted Wil Cummings on your behalf. He will be in touch. How do I get hold of this book anyone know? There is a link to Wil Cummings’ e-mail address at the end of the article. Have you tried it?